Photograph of Summer School Workers in Industry, 1930, with a caption reading "In the Cloisters - Bryn Mawr Summer School" on the bottom center of the front. Contrary to the caption, the workers are actually sitting around an outdoor fountain though the cloisters are seen in the background. 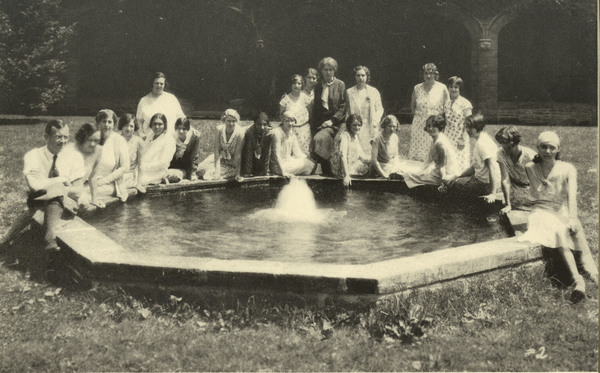 “In the Cloisters - Bryn Mawr Summer School,” The Albert M. Greenfield Digital Center for the History of Women's Education, accessed April 18, 2019, http://greenfield.brynmawr.edu/items/show/1960.